← Codes of Conduct: Being a Grown-Up. 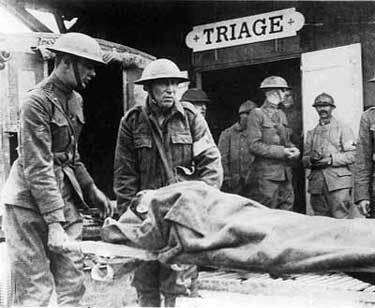 Battlefield medicine is hard medicine in many respects. Under-resourced, extreme injuries, a requirement to maintain fighting power because it might stop your own position from being overrun – it’s incredibly stressful. You’ve all seen triage in M*A*S*H episodes, no doubt, where the doctors try and group the injured into the ones that need them straight away, the ones who will probably need a patch-up later and the ones that no-one can save. The core of triage is that, with limited resources, you have to select where to apply them or you risk wasting your effort. It’s pretty unemotional stuff. Have strong policies in place that I adhere to, from the institutional level, for consistency. Refresh and alter all of my assignments, every year, to reduce any incentive to re-use a previous assignment. Brief my students and tell them that I’m serious about plagiarism. Apply detection methods to every submission (to detect global plagiarism or cheating). Check every submission against every other submission (to detect local plagiarism or cheating). Investigate every case that triggers my detection threshold. Prepare all of the evidence that is required for a hearing. Attend the hearing and present the evidence. Incorporate any changed marks, do any follow-up, counsel the student. From 6 onwards, the load on me is proportional to the number of students that I catch. If 1-3 have had any effect, and I’m serious about 4 and 5, then 6-9 should actually be for a far smaller number of students. But there are two big “if”s in there and, I know from experience, not everyone takes the same approach to plagiarism that I do, for a range of reasons. But let’s drill down into the types of plagiarism and cheating I’m talking about. Plagiarism can be as ‘light’ as forgetting to add a reference (not attributing work correctly) or as ‘heavy’ as handing up someone else’s essay with your name on it (or a similar net-sourced equivalent). Cheating is a different beast in many ways and can be harder to define, but carrying illicit notes into exams is an obvious one, as is obtaining a solution guide outside of legitimate channels. These days, of course, we have an entirely new form of work avoidance – work for hire. A student can submit a piece of work that is original and yet it is not their own work, as they have paid someone else to do it. Similarly, they could ostensibly pay someone else to sit an exam for them. At this stage, my detection efforts in 4 and 5 start to fall apart. I have no way to detect work-for-hire as it can’t be determined by comparison. If someone else studies for the exam and shows up, and we don’t detect it, then we won’t get the usual cues that indicate that other materials have been brought in. Now, of course, we build our courses so that assignments interlock with knowledge, supporting the student’s development, and we also test things in different ways. For example, my first year course has in-class quizzes, programming assignments, tutorials and on-line quizzes that test the same things in different ways. We then have an exam that tests understanding over everything else, including coding and theory. To cheat across the whole thing would require a quite systematic approach to cheating – you would have to be fairly well organised to arrange for successful work-for-hire or cheating across the entire course. Which brings me to my point. Students who are sloppy or careless, which explains things like not attributing some text occasionally, or who drop the odd bit of code in from the internet because they’re being lazy. These students, with policy framing and reminders from me, are not really a high risk in terms of cheating. In triage terms, these are the ones who are going to live so I can put a little effort in here but it’s mostly structural and self-sustaining. Students who get rushed and panic – then start doing stupid things like copying code from other students wholesale, or copying large slabs of text. They start late, don’t prepare properly, panic, and rush for something rather than a legitimate 0. These are the students who need to be found, counselled, and retrained in better practices so that they use their time more effectively. Rather than being lazy and accidental plagiarists, they are intentional but opportunistic plagiarists. These are the students who I can bring back to life with enough effort. Finally, we have the students who have made plagiarism and cheating a part of their success plan. They build in timeframes for work-for-hire, scour sources for illicit advantage, spend four hours writing cheat notes for an exam rather than studying. This is pre-meditated and systematic cheating and, despite everything I say, I’m unlikely to reach these students. Now, whenever I detect someone cheating or plagiarising, they’re going to get the full process as defined – steps 6-9, regardless of which of the student categories they’re in. But how I deal with them to bring them back will vary from group to group. The only problem is that I have limited time. I have to conduct triage to work out who I can bring back and where I can spend my effort most usefully. I don’t know if there’s any heresy in this but I believe that my duty lies to the majority of my students and the ones for whom I can achieve the best results. The Group 1s (accidental) will be woken up if they get caught but careful policy framing, education and changing assignments will deal with most of them in advance. The Group 2s (opportunistic) need shepherding and feedback, positive reinforcement and encouragement to stay righteous. They’ll take a lot of effort but the net result may be good. Group 3… if I have any time left, I might try and work with Group 3 but how can I? They have set a path which includes cheating as a definitive strategy for success. I’m not sure they’re going to do anything other than nod solemnly at me and snicker behind my back. Worse, Group 3 may have been formed this way by experience, by systems that encourage this behaviour, or by academics who slyly ignore the early signs of cheating. Group 3 students may have taken years to solidify into this form and my 6-month exposure to them is a brief inconvenience in their overall plan to achieve graduate status through other people’s effort. We make a distinction in our society between murder and manslaughter, because pre-meditation makes a difference. Group 3, pre-meditated cheating, is easier to define if we accept that “work-for-hire”, “solution scraping”, “organising someone to sit the exam” all require a deliberate and concentrated effort to subvert our academic quality requirements. Perhaps Group 3 even get a different set of outcomes from plagiarism detection? Usually, we’d give a student 0 for the assignment when first detected, 0 for the entire course on second detection and it escalates from there. Group 3 have set out on a deliberate path and we have (unfortunately) probably only detected a fraction of what they’ve done, especially if work-for-hire is involved. If we detect work-for-hire should this be an immediate course-level failure, given that it is so obviously a core part of their strategy? Is there such a thing as an opportunistic “work-for-hire” retainer? But, as it stands, Group 3 are those students must likely to not benefit positively from my intervention. I think, with regret, I’m going to have to leave them until last and hope that I have enough effort left over after dealing with everyone else to do something about them. Of course, the dead in a battlefield situation aren’t actually ignored, they’re buried. To be more precise, they’re passed to another group of people who attend to their needs at a different pace. So, a more positive view of group 3 is that they are taken out of my load and moved to somewhere where they can be dealt with more appropriately. This is where a good Transitions and Advisory Service can come in but, obviously, there will be a lot of effort required to get some students back from an engrained and systematic pattern of negative behaviour. But there are benefits to centralisation of resources and this may be somewhere that, rather than burying the dead, we look after them for a while to see if there’s any chance, any remaining spark of life, even though the surgeons didn’t have enough time on their first pass. I have no real solutions here but I’d be interested to see the discussion. Can we actually make these distinctions clearly? Do we risk moving students into other categories if we change outcomes based on what we detect? Can I make such a clear distinction based on what I detect or am I being unfair? Right now, I’m trying to be as rigorous about 1-5 as I can, going to 6-9 when I have to, and building my courses so that there’s enough interlock that it deters everyone except the most dedicated and systematic cheat from trying to use work-for-hire. That’s probably the best use of my time and I hope it gives the best results in terms on knowledge and the student experience.